How fast? Speed limit signs (R2-1) shall display the limit established by law, ordinance, regulation, or as adopted by the authorized agency. 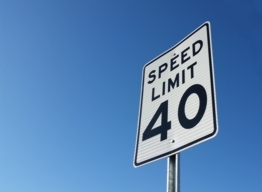 Part of the regulatory sign family, speed limit signs aide in the flow & control of vehicular traffic. Speed limit signs are available in 5MPH increments.